Mindy Raelynne Danison has suffered through two tragic miscarriages – one with the baby at seven weeks, and the other at eight weeks and five days. In response, Mindy created a Facebook photo album for each child, where she publicly celebrates their short, but much-loved lives. 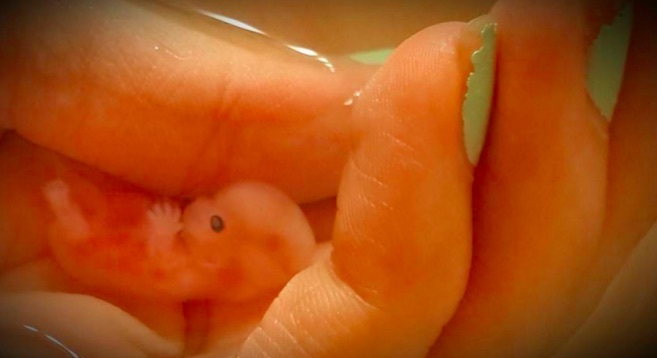 Mindy’s photos – especially one of Annabelle – have been shared on social media, and Mindy has expressed her desire for many to see her tiny babies. Their humanity could not be more obvious. He went to heaven November 6th but was born November 23. We are blessed to have got to meet our little one. Life is incredibly beautiful! We went to walmart, then at 1pm on the way to mom’s house i started having contractions. They got more intense. When i got to mom’s i got into the tub and had my beautiful amazing little Riley at 3:35pm. Home water birth is what i’d always dreamed of having and i finally got to. Seeing Riley has brought me peace and comfort. I love him and God will care for him for me until i can be with him again. baby Riley is estimated to being 7.5 weeks, Riley was born at 10 weeks. Since Riley waited for two-and-a-half weeks in Mindy’s womb to be born, his skin is somewhat discolored, but he is still beautiful, and powerfully illustrates the humanity of children at the youngest ages. To see more beautiful babies who are changing the abortion debate and showing the world the humanity of the preborn, take a look at Walter (19 weeks old), Nathan, (13 weeks old), and identical twins Chase and Cooper (22 weeks old).